It’s simple, speedy (mostly), and you get 5GB free data a month without registering – that certainly works for us. Making use of a VPN almost always cuts your internet speeds, which is no real surprise given the overheads of all that encryption. 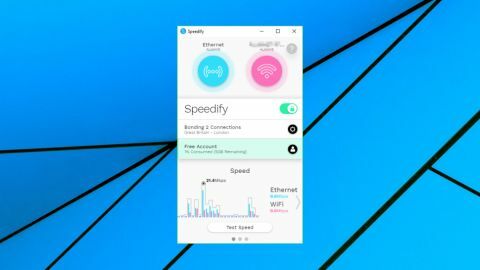 Speedify aims to fight against this issue by spreading your internet traffic across any available internet connections: Ethernet, a tethered mobile, Wi-Fi and more, up to ten in total. If one connection type is slow, Speedify will seamlessly move some of your traffic to another, maximizing your bandwidth. All this happens in the background, entirely transparent to your applications, which should carry on working just as they always did (except faster, hopefully). You don't need multiple connections to use the service, it works just fine with one – although obviously in this case, you won't get the same channel bonding advantages. However, the company still claims its other connection technologies could help improve speeds. Speedify provides clients for Windows, Mac, iOS and Android. This keeps setup relatively easy, and decent ratings on both app stores (4.0 on Google Play, 4.6 on iTunes) suggest the apps are doing something right. The company sells itself more on performance than the VPN side, and doesn't highlight the number of servers it has, or where they're located. But there is a list to be found if you hunt for it, and it turns out the service has a relatively small network of 200+ servers in over 50 locations. Speedify offers a free plan, which limits you to 5GB of data a month and use on a single device. That's a good deal for a free product, especially as you get access to all the regular servers, and you can use the service without handing over personal information to create an account. The Individual plan enables unlimited data and can be used on up to 5 devices. It's yours for $11.70 (£9) a month, or $5.30 (£4.08) if you pay for a year up-front. That's at the premium end of the VPN world, but if the service is good, it's still acceptable. The real value here is with the Family plan, which can be used by up to 5 people, yet costs a mere $19.50 (£15) a month, dropping to an equivalent $8.13 (£6.25) on the annual plan. The good news is that the site doesn't log the IP addresses of the sites you visit, of the content of the data you send or receive. The bad news is that there's some session logging, including the time and 'network location' where you connected to Speedify, your approximate location, the amount of data transferred and the length of the session. The company also points out that it 'collects approximate location from your device and from 3rd parties, for example using a GPS or IP-based approximation. This information is collected according to the consent policy on your device.' That could translate to a very good idea of where you are. If you're using Speedify's free plan to protect simple browsing sessions, this may not matter very much. But if you sign up for the commercial plan, this is a little more logging than we would usually expect. Trying Speedify is simple and hassle-free, especially if you're sampling the free plan. The Downloads page presents you with links to the Windows, Mac, Android and iOS apps; we grabbed the Windows client, ran the installer, and it set itself up fully in a matter of seconds. An opening screen explained that we had 5GB of data for free, and once we dismissed that, the program automatically connected to a local UK server, and we were online. Our client had automatically identified and was using our Ethernet and wi-fi connections. Icons for both network interfaces were displayed, along with a graph showing interface speed, which looked interesting but didn't have much practical value. Clicking a Settings icon displays options to choose the fastest server, the best server for torrents, or manually select your preferred country from the full list of 35. This is easy to use, but aside from the ability to choose locations and servers within a country, it's very short on features: there's no server load figures, no ping times, no Favorites system, no search box, no 'Recent connections' list or anything else. There is a more interesting Redundant Mode which sends all traffic across all available connections to improve reliability. This will hugely increase your data usage and means you won't benefit from any channel bonding speedups, but it you're after ultra-reliability it might be worth the trade-off. Speedify's most important options cover its rules for connection handling. By default, the system uses Wi-Fi whenever it's available, for example, but you can tell it to use other connection types first, or only to use Wi-Fi when other connections are unavailable. It's possible to set daily or monthly limits, handy for metered connections, or you can even disable Wi-Fi support altogether – it's your call. The clients' extra icons, buttons and graphs make for a more complicated interface than you'll see with most VPN apps. There are one or two small usability issues, too, in particular the lack of any desktop notifications to let you know when it connects or disconnects. Overall, though, the client does a decent job, especially considering it must implement the extra complexities of Speedify's channel bonding, and you'll find your way around its interface within a very few minutes. We began to check this out for ourselves by connecting to Speedify's UK server and accessing BBC iPlayer. This worked just as expected, and we were able to stream content without difficulty. Accessing US-only YouTube content was just as easy, with every US Speedify server bypassing YouTube's minimal protection and getting us in. Netflix is the real test of any VPN, though, and unfortunately Speedify didn't allow us to stream content. A website FAQ page admitting Netflix is now blocked and recommending you download movies instead (when possible) suggests this situation isn't going to change any time soon. In our tests, Speedify's performance on a single connection was excellent, with the service typically giving us up to 65Mbps downloads on a 75Mbps line. When you factor in the encryption, and routing your traffic through another server, that's about as good as it gets. UK to European connections saw speeds become less consistent, although they still regularly maxed out our test line, with downloads ranging from 45-65Mbps. If you have a faster internet connection, you could easily see better speeds. US speeds averaged an excellent 50Mbps from our nearest New York locations, and was still very acceptable at 35-45Mbps on the west coast. Performance did fall drastically over long distances, as well as becoming much more inconsistent. Indonesia struggled to reach 8Mbps, for instance, while Australia's results ranged from 5 to 27Mbps. We saw no definite improvement from channel bonding with wifi or a tethered mobile, but it's difficult to say for sure when apparent speeds can be so inconsistent (and results will also vary depending on your network and the hardware you're using). Speedify did perform very well for most of the time, though, and it's worth testing the service to see how it performs for you. Speedify's channel bonding didn't make a noticeable speed difference to us, but if your VPN needs are simple and performance is a priority, give it a try anyway. If nothing else, the 5GB per month free plan could be handy for use as a backup VPN.